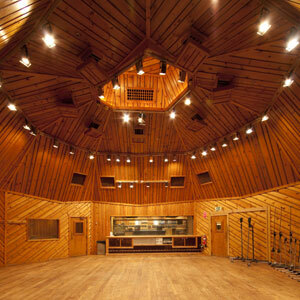 Not every record can be tracked in a room like this. I often work with tracks that have been recorded in a home/basement studio somewhere. A lot of times the bands almost apologetically tell me that they only have X amount of microphones or that the recording was pretty basic. Little do they know, I freaking love working on these tracks. Though it is nice to have 15 mics on drums recorded in a top-notch Studio A somewhere (ok, really nice), there is a certain freedom that comes with limitations. I find that with really well recorded tracks, I’m mostly tweaking here and there. Small stuff. But with the home recorded tracks, I get to be a bit more heavy-handed and go nuts with it; satisfying the inner-knob-turner in me to the highest degree. In 2013, I worked with, in my oh-so-humble-opinion, one of the best rock bands in Brazil, Quarto Astral. These guys take “epic jam” to a whole new level. They had exactly FOUR mics on the drums. Kick, snare, stereo overheads. Their whole recording setup was absolutely minimal and as basic as could be. But I freaking loved working on it! Have a listen to the tune “Virgem”, which clocking in at over 11 minutes, is only the 2nd longest song on the EP. Epic. Skip ahead to 33:45-ish if you’re not in the mood for epic and want to hear it when it picks up a bit. Quarto Astral is light on drum mics and heavy on drum fills…what to do? AUTOMATE. Remember me saying you should automate every single drum fill? Well, you should be automating even more with limited mics. You can see in the picture below that I automate the snare fills up 2 dB, and then when the toms enter, the drums come up another 2dB. A total of 4 dB higher across all the drum mics. With long songs that are fill-heavy, this took some work. But it paid off in the end. One drum fill. Snare roll into a tom roll. Up 2dB and then up an additional 2dB. This is a 45 second grab of the song. You can see how much automation is happening in the drums alone. Yup, I’m gonna talk about distortion again. With limited tracks, there is a lot of space to fill in a digital mix. Go heavy on harmonic distortion. Some of my favorite plugins to “fill in the gaps” are Lo-Fi, TapeHead and Vintage Warmer 2. Plugins like these will act as a glue and will help to “de-sterilize” your mix. This is especially important when the tracks are few! Don’t be afraid to strap one across your master bus. With limited tracks, there is a lot of room to cover in the sonic picture so don’t be afraid to pull out all the stops. Use delay tricks, doubling tricks, widening tricks, effects tricks…everything you can throw at it. Use drum samples if needed/wanted. Focus on dynamics. Go nuts and think how much fun it is to turn this many knobs! 4. Embrace the recording limitations, get rid of excuses, and jump in. No, no, and no. True, the final mix won’t sound like it was recorded in a million dollar studio…but it can be a good mix that grabs the listener. Yes, it will probably take more work to get it to that point, but so what? Once the mix is done, it is DONE and will live on forever. Spend a few more hours, look at the advantages of having fewer tracks, stop making excuses, and make it sound rad. You are so correct my friend. Lately, even when I track drums with 16 mics, I find I reduce my mix and edit time by primarily using the 4 basic (kick, snare, OHR, OHL) mics for the drums and only picking out additional tracks if I really want to emphasize or effect a certain fill that the OH mics didn’t quite grab. I try and stay to my (2 track ping pong) roots and go with less is best. Hey Jim! I’m right there with you. Limitations breed creativity. I love having my pick out of twenty drum tracks, but it took a long time for me figure out that just because they are there doesn’t mean that they MUST be used. In the end, go with what sounds good. Everything else is just fluff.